This morning in San Francisco TNW met with Yu Yongfu, CEO of UCWeb, makers of the popular UCBrowser mobile browser, and other members of his team – translator in tow – to discuss the company’s success in the Asian market, and its plans to expand into the United States. It’s not every day you have a Mandarin to English translator in your living room. Happily, Mr. Yu was more than willing to take our questions. This post is segmented into three pieces: A short look at the Asian Internet market; UCWeb’s progress as a browser thus far, technologically; And finally, its plans to enter, and conquer the U.S. market. More than 50 million active gaming users. That in mind, let’s get into it. You likely haven’t heard of UCWeb. In the European and American regions, the browser doesn’t have much share, either market or mind. However, in Asia it’s a veritable powerhouse. UCWeb has 300 million monthly active users, a figure it prefers to compare to Twitter which it claims is roughly the same size. In six different countries, UCWeb has market share of over 10%. In India, that figure is more than 20%. In China, more than 50%. Having double-digit market share in India and China, the company is a leading Asian Internet firm. That said, the Asian market itself is unique. As Yu told TNW, a number of factors led to mobile Internet undergoing earlier and more persistent development in that region than in the United States. To take a single example, as most American’s commute in a car and not on train, the total time that they have to solely tinker with their mobile is lower than in Asian countries. Thus, pressure to improve mobile Internet browsing here in the United States has been low compared to that of other markets. In the thinking of UCWeb, mobile Internet browsing in the United States didn’t kick off until the iPhone was released. This is true in a way, as before the iPhone mobile browsing was a painful experience – slow, and with few, expensive data options. That UCWeb was born in Asia, therefore, and not a different location is not surprising. In short, Asian market dynamics have led to mobile Internet browsing technology to be a step above such software in the United States. According to Yu, mobile browsing really kicked off in Asia in 2001, a full six years before Apple gave the world the iPhone. So, what does UCWeb do? Let’s take a look. UCBrowser is a cross-platform browser that doesn’t look much like the browser on your current handset, at least when you fire it up: the app has a homepage that offers a number of services; a blank page this is not. The browser’s homescreen is a portal of sorts to services – e-commerce, that sort of thing. 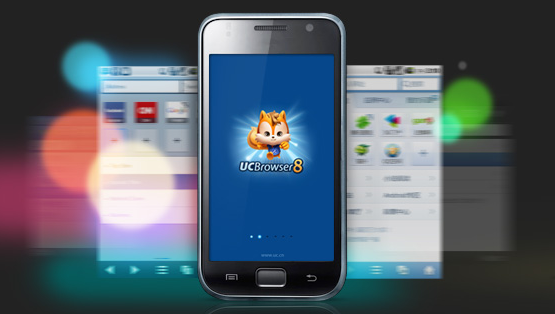 Also, UCBrowser contains its own application platform and store. This may sound odd, but in the Asian market it’s certainly not. In fact, third-party app stores have more market share in the region than Google’s Play and Apple’s App Store combined. And UCWeb’s app platform is well used; as we noted, gaming alone on its titles supports more than 50 million monthly active users. UCWeb makes money from UCBrowser in two ways: advertisements, and taking a cut of monies that flow through the games on its platform. Advertisements comprise a larger percentage of its revenues. Now, to the technology itself. What makes its product tick? UCWeb employs what it calls cloud computing technology behind the browser to lower its data usage, and speed up load times. If that sounds familiar, Amazon’s Silk browser does something similar. However, UCWeb did it first, the firm told TNW. In its view, using this form of cloud-boosted browsing does a few things. It calls them the ‘Three Ss’ – UCWeb is big on lists – speed, storage and security. UCBrowser tries to deliver content to users more quickly, using less of data bandwidth, and in a way that is secure. Given the nascence of the company’s English-language version, more on that shortly, TNW hasn’t had the chance yet to fully test its claims. However, given its market share figures, UCWeb is certainly delivering something that resonates. Why not just go after every market? Localization. Currently, UCWeb has a small office open in Sunnyvale – a city in the Bay Area – and is actively learning about the U.S. market. What is there to learn? A short anecdote that Yu shared is illustrative: In American, money is green, and a color that we associate with positive things, such as a rising stock market. Red, on the other hand, in the States, is a cautionary color. In the Chinese market, the currency is red, and it’s considered to be a lucky color. You need to know that, as it can help you make product choices. Thus, the company is working on unpacking the U.S. Internet market. UCWeb has something of a large goal: to build a browser of such high quality for the United States that it will rise to the top of the app store charts. Once it has done this, it will work with partners to have it software pre-installed on handsets that are headed for sale. In short, UCWeb wants to build your next mobile browser. Pick up your phone and ask yourself if you want a new browser? I suspect that the answer is yes, but that that is not a question you have asked yourself. It’s an interesting proposition. The company has a small, 10 person team in the States at the moment. However, UCWeb intends to open a larger, R&D office here down the road. There is a high concentration of talent here, Yu stated. So, UCWeb is currently in the process of collecting information, honing its product, and slowly launching itself into this app ecosystem. A beta for iPhone is currently in the App Store. The iPad version will be out shortly. In a few months, its Android beta will be ready to go. Alright then UCWeb, you have our attention. Let’s see what you’ve got.